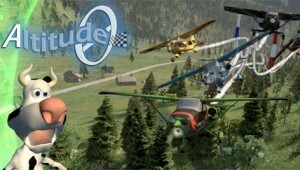 Altitude0 Teaser Trailer – Planes and Cows Don’t Mix – Released! Today we finally released an official teaser trailer of Altitude0. The website has been alive for many months now mainly as a developer’s blog. This time we are trying to spread the word about Altitude0 to the wider audience on a chronically limited budget. We created this teaser trailer to hopefully get some interest in our game. We wish people find this trailer entertaining because we certainly believe that this game will be fun to play. The main character in this trailer is Anka, the Cow and some would say it symbolizes the gap and coming together of nature and humans. But in reality, I guess it represents how we the main developers feel about our surroundings and where we are developing this game day after day, imagining more action and excitement. Hopefully you enjoy it and we will try to get a first playable demo out soon…really soon.